Ludum Dare 35 was my first ever game jam. I was fairly apprehensive going into it, all I heard leading up to the event was that more than half the people who enter these jams don’t end up submitting anything before the deadline. With that in mind my goal for this first jam was just to submit “something”, even if it wasn’t everything I wanted or even a good game. Long story short, I did manage to submit something, and ended up somewhat happy with the end result. If you’d like to see the final result, you can check it out here. The ratings are a little hard to understand, although it helps to know that most categories have around 900 entries, except for Humor and Audio which have around 600. 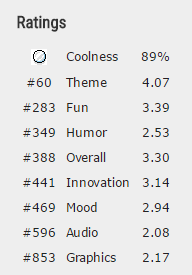 With that in mind you can see that I hit rock bottom for both Audio and Graphics, although I’m fairly happy with how I did in the other categories. I’m especially please with my Theme ranking, getting into the top 100 in any of them is something to be happy about. I learnt quite a lot during this game jam, especially mistakes which I’ll be sure not to make again. I didn’t read the rules properly until a couple of days before the jam started, and didn’t realise that I couldn’t use publicly available, pre-made graphics and audio, which meant I was woefully unprepared for how to create those. I also messed up uploading my project several times, first by linking to the web version incorrectly, then learning that I’d uploaded the wrong format for the web version, then finally by having the default resolution be too big to display cleanly inside the web game window. While you could get around this by entering full-screen mode, I’d assigned ESC to bring up the menu in-game, which then threw you back out of full-screen mode. Every one of those is a mistake I’ll be sure not to make next time. There’s definitely some things I need to work on before my next jam. The graphics and audio are a definite must, although I don’t ever expect to be great at them. I would at least like to get to a point where I can make a game out of something other than primitive shapes, even it still falls firmly into the category of “programmer art”. Making music is also something I’m never going to be good at, but the rules of the jam allow you to make songs by remixing very basic samples, and it would be nice to learn enough to put together some simple background music. Basic sound effects I made using Bfxr, but there’s still a lot I don’t know about even that straightforward tool. The biggest area I found myself struggling with was level design. I was fine coming up with mechanics and ways to use them, but when it came to spreading them throughout a level I just didn’t know how to lay them out. You can see this in the game, every new mechanic is introduced fairly quickly and is only used a couple of times. While this can be nice for a short game it’s not sustainable for anything longer. I wasn’t expecting to have as much trouble with this area as I did, and I definitely want to spend some more time studying up and practising putting together some more levels. I would like to fix up some of the bugs and minor issues I had left when I submitted, mostly the physics glitches and a couple of other bits that didn’t feel nice. I have no plans to take it further at this point, but if anyone’s interested in what I did they can take a look at the source code on my Bitbucket Repo.